Port Hunding, also called Stros M'Kai, is a city on the island of Stros M'Kai. Situated north of Hunding Bay, the city takes up a large portion of the island's area. 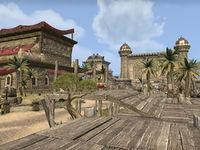 Port Hunding is divided into roughly four districts: the harbor, market, town square, and old quarter. Ships entering the harbor are greeted by a large metal statue of Frandar Hunding, with his sword extending out to sea. The town square has also been called the Plaza of the Three Princes and features the Monument of the Three Princes, standing over the Regent's Pool. The Draggin' Tale Inn was established here in 2E 284 and was still in existence 580 years later. It derives its name from the head of a dragon, which was brought from Noota Nara in Black Marsh and mounted on a wall within the establishment. 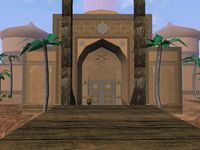 A temple dedicated to Arkay was constructed sometime after 2E 582 and a Mages Guild guildhall in 2E 638. Another tavern, the Screaming Mermaid, was notable for using Dwemer piping in its kitchen. The old quarter lies northeast of the town square. A large palace is built north of the square on a section of land separated by a river. Beneath the palace is a series of catacombs, once known as the Grave, where the worst criminals are kept. The palace's treasure vaults are also contained within. On a small island southeast of the city lies Hunding's Palatial Hall, once the home of the legendary Captain Izad. It is a mansion rivaling the grandeur of the palace. Both of these structures are accessible by bridges. In 2E 582, Port Hunding was ruled by Headman Bhosek, a universally-disliked and severe ruler. His Bloody Fists kept order in town. 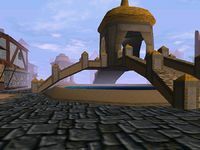 Captain Kaleen of The Spearhead organized a heist to steal shipping logs from Bhosek, which she sold to King Fahara'jad for gold and as evidence that Bhosek was still raiding Breton ships, despite being part of the Daggerfall Covenant. Prince A'tor, the son of High King Thassad II, was born in Stros M'Kai. Following his father's death in 2E 862, the Forebears led an uprising in Sentinel, forcing A'tor to retreat to his ancestral home with other loyal Crowns. From his palace, he led a counterattack that became the Redguard civil war. The war came to a close when the Third Empire allied with the Forebears and crushed the Crowns at the Battle of Hunding Bay. Imperial Admiral Amiel Richton was made provisional governor of the island. The old quarter was burned to the ground during the battle. In 2E 864, Cyrus arrived in Stros M'Kai. During his adventures he gathered a great deal of information from the townsfolk and acquired the pieces of a map leading to the Flask of Lillandril. His adventure ended when he ordered the Restless League to attack the harbor while he infiltrated the palace. Richton was defeated and Cyrus' sister Iszara became the city's ruler. She immediately began reconstruction of the old quarter, and celebrations for the victory were held there after Cyrus left the island. This page was last modified on 23 October 2018, at 11:43.